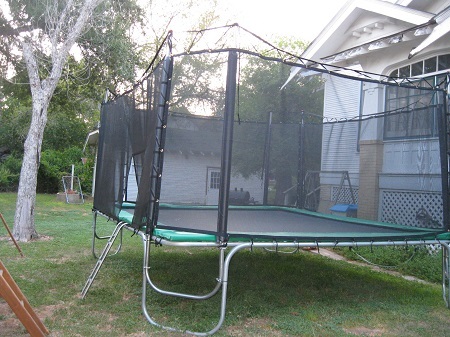 "THE TEXAS CAGE" (17/15) trampoline enclosure fits our 15'x17' or 14'x16' "Texas Extreme" trampoline. Structural steel poles are galvanize coated inside and out for corrosion resistance. Padded poles w/20oz. vinyl covers (NOT CHEAP PLASTIC FROM CHINA!) and advanced "NO-CLIMB" net protect you from falls. Our enclosure net Panels are designed to fit right! No complicated net adjustments. All parts designed to withstand UV and weather exposure.